Prothonotary Warbler eggs in nest cup. Photo by Larry Broadbent. 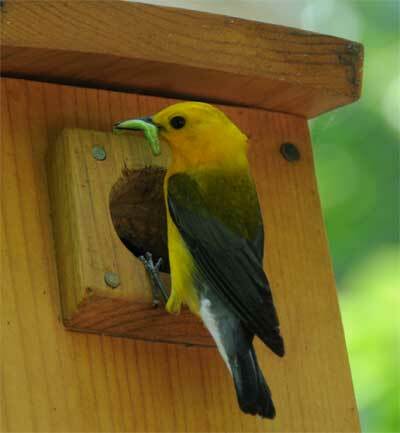 See Prothonotary Warbler Biology for more information on nesting behavior, nestboxes, monitoring, etc. Nest Description: Nest ID: Mainly mosses and liverwort, plus lichen, rootlets, small twigs and dry leaves, and strips of bark (e.g., grape and cypress), plant down. Usually neatly rounded, cup shaped hollow, smoothly lined with fine grasses and sedges, poison ivy tendrils, leaf stems and skeletonized leaves, fishing line, and feathers. Nest usually built up within 10 cm of entrance hole, regardless of how deep the box is. See photo of PROW collecting moss for nest. Egg Description: Eggs: Oval, smooth, somewhat glossy shell, with a creamy or slightly yellow tinge. 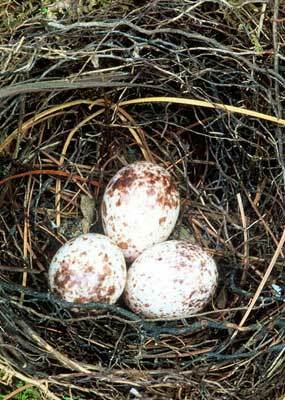 Boldly and liberally spotted/blotched with dull reddish brown and pale purplish gray spots and splotches over the entire egg. MAY cover eggs when leaving box to protect from predators. 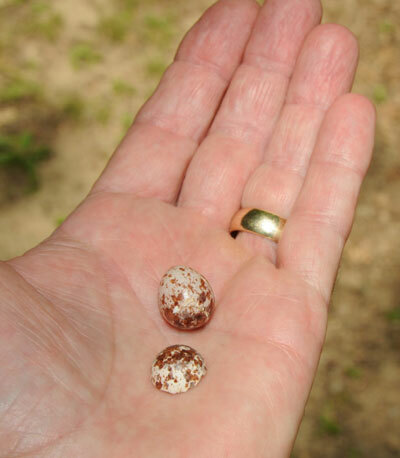 Left: Photo of an unhatched eggs PROW egg, by Robert Peak of Henderson, KY. 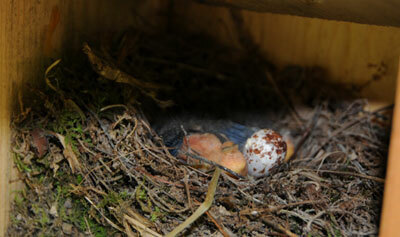 Peak reported that "the PROW laid four eggs in the nest box, and three hatched. After the birds fledged, I discovered that the unhatched eggs egg had an “extra” half-egg shell encased around one end of it. (That may, or may not, have been the reason the egg didn’t hatch.) I’ve seen this kind of thing happen with bluebird eggs..."
More on unhatched eggs.htm">why some eggs don't hatch. Below: A PROW brings food to the nest. This box was hanging on a metal shepherd's hook. Photo by Yvonne and Al Bordelon of Little Tchefuncte Hummingbird Hill. PROW nestlings and one unhatched eggs egg. Photo by Robert Peak. Out of four eggs, three hatched. Observation by Robert Peak: "The female PROW spent a great deal of time stripping the loose bark off cedar trees (located around our campsite) to use as the base material for the nest. It was interesting to watch her wrestle with each piece as she pulled it off the tree, and as she maneuvered it into the entrance hole...she seemed to make countless trips to gather bark strips." PROW nestling, photo taken 7/5/08. See video of PROW feeding through entrance hole. Also see photo of PROW feeding at an entrance to a cavity in a tree. 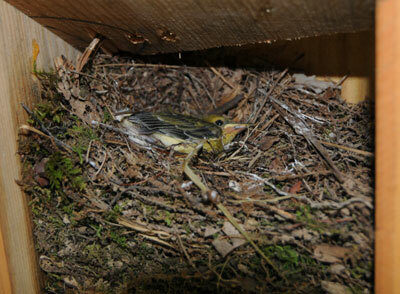 You can see a young nestling (maybe a day or two before fledging) in this photo, as well as composition of nest. Photo by Robert Peak. Some say PROWs are very tolerant of humans. Others note they may be sensitive to human disturbance around the nest site, so just in case, use caution during monitoring. Try to monitor on a regular cycle, and be as quiet as possible. After hatching and especially close to fledgling, may perform broken-wing display on ground. Young may fledge at 9 days if disturbed. 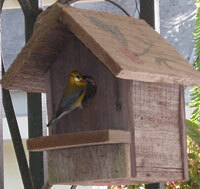 See Prothonotary Warbler Biology for more information on nesting behavior, nestboxes, monitoring, etc. 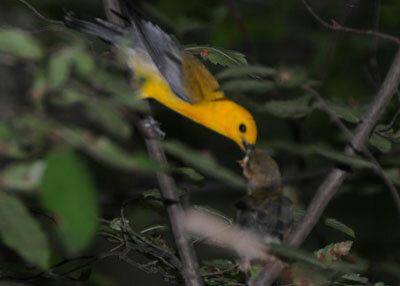 Left: PROW adult feeding a caterpillar to nestlings. PROW will often macerate caterpillars by whacking them repeatedly on a branch before feeding them to young. PROW often feed young while perched on the entrance hole. This family nested in a box attached to the back of a fifth-wheel camper at a campsite. Photo by Robert Peak. Below: A PROW feeding young. Photo by Yvonne and Al Bordelon of Little Tchefuncte Hummingbird Hill. PROW adult feeding fledgling. 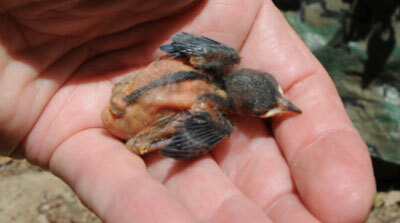 Parents feed juveniles up to 35 days after fledging that had just left the box. The parents divide up the young and feed only those, unless the female starts a second brood (in which case the male feeds all young.) Photo by Robert Peak. Robert Peak watched a PROW fledging, and described it thus: "Its flight (directly to the ground) was very compromised. Within minutes, it fluttered to the brush pile at our campsite and began moving up the highest branches on the pile, until it reached a small sapling branch. I was amazed that the whole process took only a few minutes. Shortly after reaching a point of safety in the sapling, the adult PROW came to feed it…sort of a reward for the successful venture into the world."